Today, I decided to try a new take on a classic, and classically difficult, dish: Eggplant Parmesan. I usually stick to ordering this in restaurants because it is such a pain in the booty to make,. But I am here to tell you: it’s possible to make at home without needing to be a Michelin starred chef! It is made in individual pieces so it is easy to serve and save for later! It is baked rather than fried! The eggplant slices crisp up so nicely, I ate them like chips! I chose to serve this over zoodles with Mama Jess Organic Garden Pasta Sauce to load up on the veggies (Zucchini + Eggplant + Five Veggies in the Sauce = 7 Veggie Dinner!). If you’re craving pasta, though, I won’t judge if you enjoy this baked eggplant parmesan with angel hair pasta! 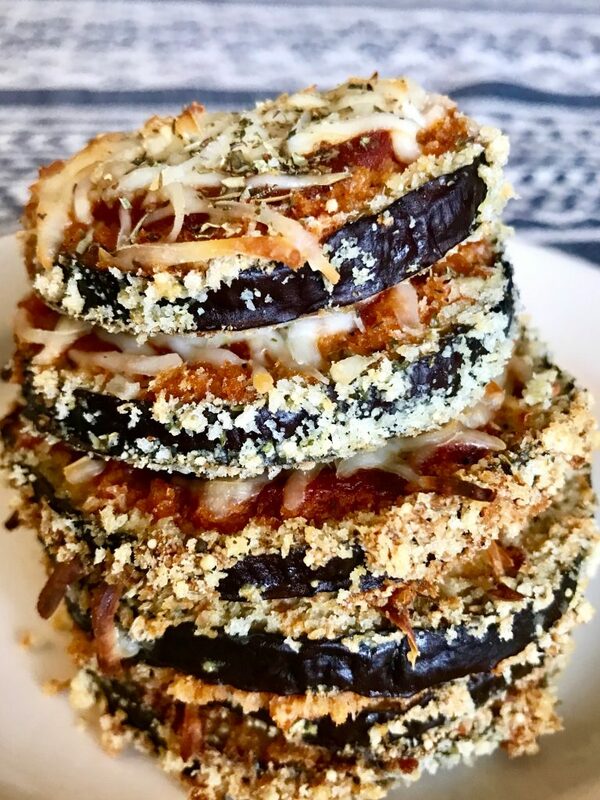 The most important part about working with eggplant is making sure to slice it, generously salt the slices, and then let them rest for about 20 minutes on each side to squeeze out the acidity and bitterness. I used plenty of paper towels to make sure this was done correctly. It paid off and really helped the flavor. More details about that in the directions. After that, the recipe is pretty straight forward and easy going! I was even able to do a few loads of laundry while I worked on this—a definite win! Slice eggplant into ¼ inch thick disks, placing in an even layer on a paper towel. Salt heavily and let sit for 20 minutes. Pat dry with a paper towel, flip slices, then repeat salting and resting for 20 minutes on the other side. This will allow the water to seep out, along with the acidity and bitterness. Combine breadcrumbs and spices in a shallow dish. In a second shallow dish, beat the eggs. Dip each slice of eggplant in the egg followed by the breadcrumb mixture, making sure each side is evenly coated. Place in a single layer on the baking sheet. Bake eggplant for 15 minutes, flip, bake for another 10 minutes. Take eggplant out of oven and spoon a little bit of Mama Jess pasta sauce on each disc, then lightly cove with mozzarella cheese. 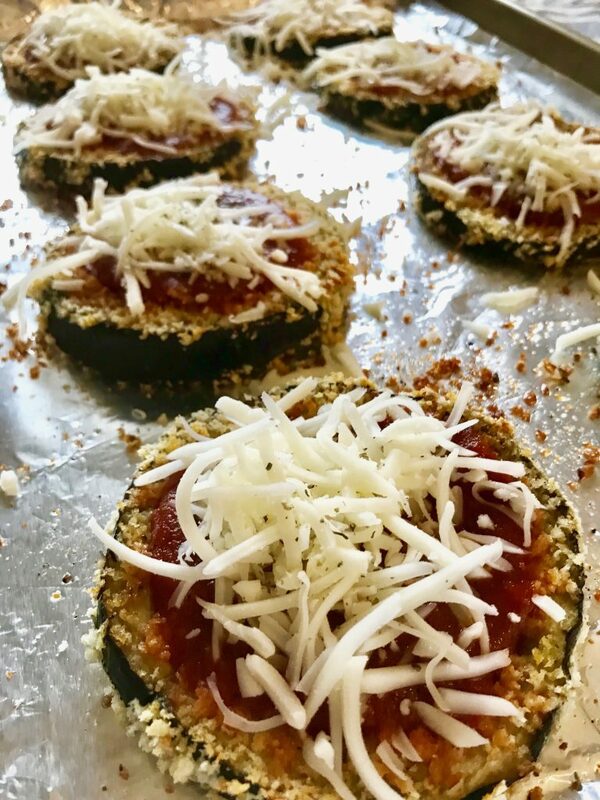 Sprinkle a little more basil on top, then bake for an addition 10 minutes, or until the cheese is melted and bubbling. 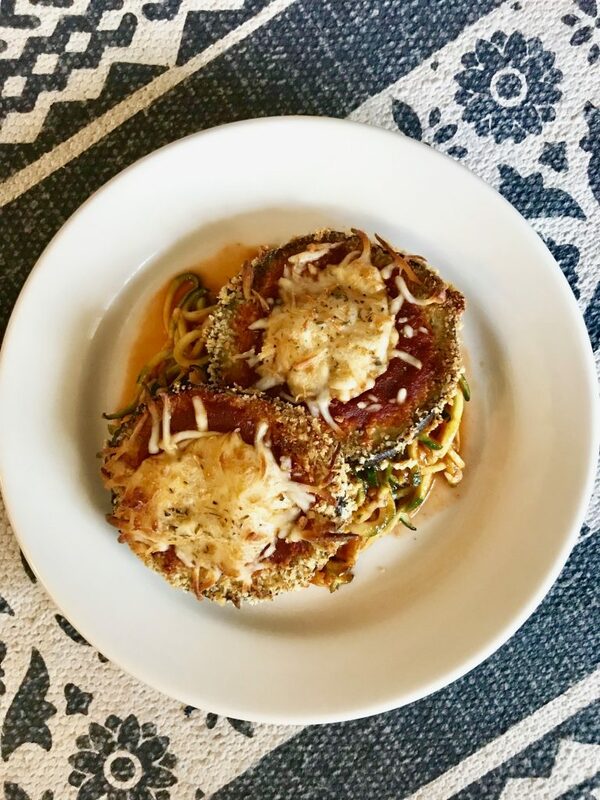 Serve over zoodles with Mama Jess sauce and enjoy!